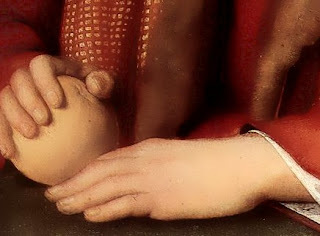 Young Man with an Apple. c.1505. Uffizi. Raphael's portraits have an other-worldly, sublime quality. He depicted his mortal subjects with as much grace and beauty as his Madonnas - if anything, the true charm of his Madonnas is that they are divine beings with a very human tenderness. One of the lesser known treats at the Uffizi Gallery is Raphael's Young Man with an Apple. Completed in 1505, it coincides with a period where Raphael was known to have spent more time in Florence. During this time, it is believed he was exposed to the works of Leonardo da Vinci and learnt much from the older master, including refinements to composition, as well as techniques to enhance the realistic depiction of flesh such as sfumato. Young Man with an Apple is a fascinating piece - not only is it wonderful to behold as a piece of Raphael's development into what many would regard as a High Renaissance ideal, it is also loaded with history, which is equally as interesting to contemplate. The young man firmly cups an apple. A symbol of knowledge, sin and the fall of man in the Biblical tradition. The gestures of the hands encompassing and stabilising the fruit proclaims that the sitter is aware of the perils of the world, but has them firmly under control. It is a delightful symbolic touch, which would have been very much appreciated by contemporary viewers. 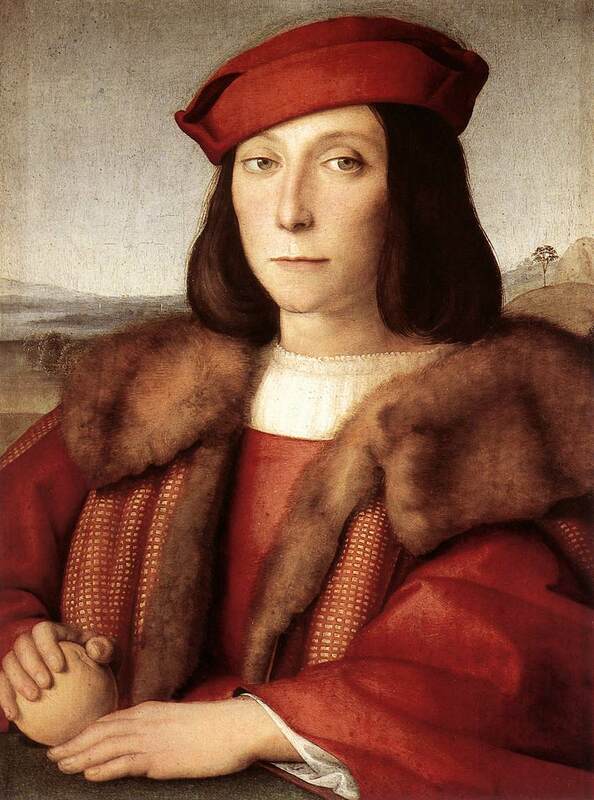 The identity of the sitter is believed to be Francesco Maria I della Rovere - who would have been about 15 years of age upon the completion of the work. 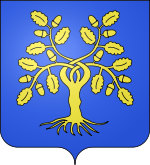 The della Rovere were a powerful family by the time of the late 15th Century. Indeed, the della Rovere legacy to the world of Renaissance art is quite significant. Another Francesco della Rovere ruled as Pope Sixtus IV between 1471-84 and instigated the construction of The Sistine Chapel. In 1503, Giuliano della Rovere commenced his tenure as Pope Julius II. He was later responsible for commissioning Michelangelo's work on the Sistine Chapel, as well as Raphael's work in the Vatican Loggia, which was to include the famed fresco, Causarum Cognitio (Knowledge of Causes), later known as The School of Athens. Pope Julius II was the uncle of the young Francesco Maria I depicted in Young Man with an Apple. Francesco Maria I himself came to prominence as a mercenary soldier, or condottiero, fighting in numerous battles - with allegiances shifting during an unstable time in Italy. 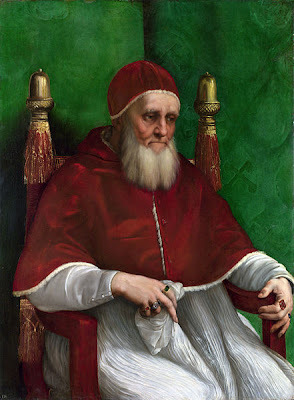 During the period of his uncle's reign as Pope, he enjoyed a degree of favour which was lost after Julius death and the subsequent eras of Medici Popes, Leo X and Clement VII. Francesco Maria I served as Duke of Urbino between 1508-1538, and accumulated further wealth and prominence via marriage into the powerful Gonzaga family of Mantua. In Young Man with an Apple, the rich red of the cloak, the gold threaded material and fur lined collars were all added to indicate the young man as blessed by wealth. There are some interesting parallels here with a later Raphael portrait of Julius II. Red and gold is also prominent in the papal chair - the acorn motifs of the chair are incorporated as symbols of the della Rovere family. It could be said that the colours used in the earlier portrait of Francesco Maria are hearkening to his famous papal relative, Sixtus IV. It is interesting to contemplate how the art we see as sublime and timeless was so dependent on political machinations. Had the della Rovere not come to prominence, we would not have had the Sistine Chapel nor the Raphael Loggia - an almost impossible contemplation for many since these works have become iconic of his period of art. If you ever find yourself in Florence, whilst strolling around at the Uffizi, take some extra time to peer closely at Young Man with an Apple. In its present spot, it is actually on the same wall as Raphael's famous self portrait. As an extra treat, I invite you to watch some clips from this wonderful program presented by UK art historian Tim Marlow. Like Andrew Graham-Dixon, Tim Marlow also trained at the Courtauld Institute, and has since gone on to prominence as an arts broadcaster. His summations are exuberant and erudite, and highly watchable. A few years ago he presented a series called Great Artists which focused on many of the prominent artists from the Renaissance to the Impressionists. The episode on Raphael was particularly stunning. This series is highly recommended for scholars and students alike. Other programs are brought down by monotonous narration, or a self important critic lambasting their opinion in a heavy handed manner. This is something you pleasantly do not have to worry about when watching Mr. Marlow. His relaxed style is refreshing to watch as he celebrates the wonderful and sublime aspects of art in way that not only imparts knowledge, but is also quite inspiring. Are you familiar with Melozzo da Forli's depiction of the "Installation of Platina as Papal Librarian to Sixtus IV? It shows Sixtus IV with his nephews including a young, dynamic Giuliano della Rovere. Raphael's version of Julius Ii is a tired old man but in Melozzo's version we can see the man that even Machiavelli had to grudgingly admire. @anon - glad you are enjoying the shorter URL - me too! Fun post. I don't love Raphael as much as you, but I always like to learn about him. (Don't get me wrong: I like him, but every once in awhile I find his figures to be slightly disproportionate and funky). That being said, I think his compositions and colors capture a feeling of serenity that is unparalleled. Cheers Ben! Speaking of coincidences... I just came across another purported portrait of Francesco Maria during an inquiry into an attribute of a Giorgione painting - an exciting revelation/coincidence I will be posting about later! @M - Serenity is a wonderful description. I don't think its possible to behold Raphael and not be captivated the technique or drawn into a contemplation of the underlying history.